Your vision is important to you, and it's important to us. Vision screenings don't always give the entire picture of a person's vision and eye health. Our comprehensive eye examinations evaluate vision and visual skills such as eye alignment and focusing, as well as the overall health of the eye. Some eye disease and disorders do not have symptoms in the early stages and certain medications and health problems may effect vision and eye health in various ways. This is why it is important for everyone to have regular eye care, even those who do not regularly wear glasses. 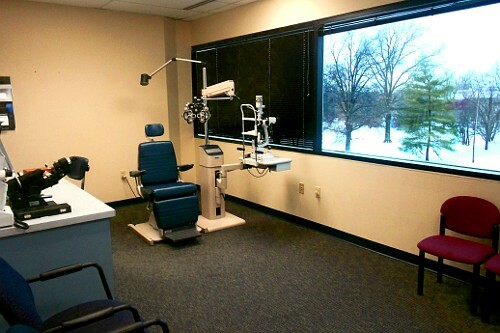 Our office is pleased to offer primary eye care for the entire family, including children, teens, and adults. Come browse our eyeglass selection. Our highly qualified opticians will help you select the best frame for you and fit your glasses for extended comfort and optimum vision. They will recommend the best lens options for you that are most appropriate for your prescription, individualized needs, and lifestyle. Our optical is now complete with a lens edger, which allows us to finish many of our eyeglasses in the office, reducing the time many of our patients wait for their glasses or sometimes even eliminating a return visit to pick up the glasses! Advances in contact lens designs and materials have made them a practical and comfortable option for those requiring vision correction, even for individuals who may not have been successful at wearing contacts in the past. Newer soft lens materials are more breathable, contain more moisture and come in many different replacement options. For instance, daily disposable contact lenses are a great choice for those with seasonal allergies or work/play in dusty environments or those who want a contact lens option for occasional wear. There is no age limit for wearing contact lenses. Recent studies have shown an improvement in the quality of life for children and teens fit with contact lenses, both with visual skills and self-image. It is an especially practical option for those participating in activities like sports, gymnastics, and dance. After the age 40 is a time when many individuals drop out of contact lenses due to a decrease in vision for near work. The great news is that new designs in multifocal contact lenses are providing many with good near vision without the need for reading glasses or sacrificing distance vision or depth perception! Our contact lens services include Dr. Merriman fitting you with the best contact lenses for your eyes and visual needs, trial contact lenses and supplies to get you started, instructions on how to handle and wear the lenses properly, and follow-up visits to make sure the contacts are right. Contact us at 314-997-3937 to schedule your eye exam.